Preparing for Tuesday. When IQ84 Is Finally Released! Also, find the New York Times story on Haruki Murakami here. I’m so excited I can hardly stand it. I’m not even going to join in any read-alongs for it; I have to take 1Q84 on my own time, at my own pace, unrestrained by anyone else’s schedule or opinion. Love you, Haruki, favorite author of mine. I need to finish Marriage Plot first though. Enjoy when you do get to read this one. Kailana, you have massive treats in store for you! Diane, I have one coming in hardcover and one for my nook. Want to make sure I'm covered! Best to you with Eugenides (yuck :). I guess I have to start reading his books!!! Patty, if you've never read him before perhaps you'd like to start with After Dark. It is not long, but it is full of all the mysterious qualities and mood he is able to create which I so admire. Terri, I have no doubt in my mind that I'll reread it at some point or another! I never fully grasp all he says in the first go around. I ordered a digital edition for my nook precisely because I don't want to wait for the mailman. However, that does me little good since I'll be teaching until 4:00 anyway. Hope you're able to open your copy sooner! Ally, I wonder how it came in English to other countries before the US? When did you get it, you luck?! Your excitement over IQ84 is contagious! I'm going to place this on hold at the library. Enjoy it! I received a review copy a little over a week ago and I am loving it, and enjoying taking it slow. I'm so excited!! Already have mine preordered!!! No, it's not in English, it was translated into Romanian from Japanese last year 🙂 I know, truly incredible! 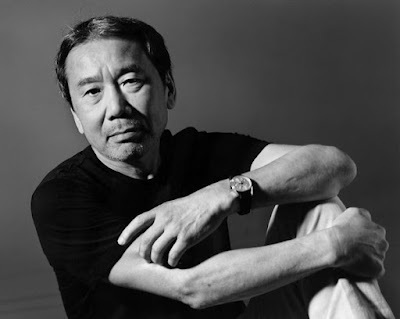 I was really taken with Murakami earlier this year when I read his short story, “Blind Willow, Sleeping Woman” as part of my short story reading project. I will have to read IQ84 also. I will buy this long awaited book as a Kindle edition, what with it's 900+ pages it will be a pleasure to hold. I am also excited, this is going to be a long read which I will take in slowly and with pleasure, might take me a while and it will be so worth every single page. I've got it too but have decided I need to read Hear the Wind Sing and Pinball 1973 just to be different. I'm halfway through the latter so hopefully I'll start 1Q84 soon but like you I'll be doing it at my own pace. I have bought the American copy of 1Q84 which means waiting for a bit longer then I otherwise would have. My reasons for this is because I don't like the British hardbacks. Firstly, the cover is boring compared to the US version. Secondly why should I buy 2 hardbacks when it costs me exactly the same (on Amazon not anywhere else) to buy the US version and have it shipped across the ocean? Also, I have a slight problem that if I read the first book I'd feel like I'd finished something when I hadn't. I find it difficult to pick up another book by the same author after finishing one before. I know this is completely bizarre and psychological, but I don't want to feel like I have finished a book because I've come to the last page and then have to pick up another book. It'd be different if it was a normal series but it isn't. I'm probably just being completely weird but I just want to be able to read parts 1-3 in one go, as one book. What's the point in publishing the third book a week later? It just frustrates me! So I am currently waiting to get my fingers on 1Q84 and trying to resist running down to the bookshop just to get a feel of it. 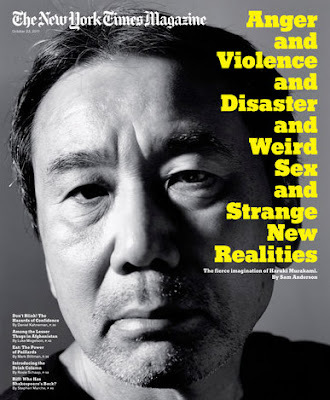 Bellezza, I knew you would blog something about Murakami – love the links! I've been reading stuff on the Gurdian and the Atlantic about this release. It all got me more excited to read the book 🙂 Just got my copy today and I'm already looking forward to starting it this weekend (although that may change depending how I feel – been feeling rather ill lately, so not really up for reading or anything for that matter – of course it is Murakami, so we'll see). I want to take it slow, because I want it all to sink in and I just want to enjoy the brilliant world of Murakami – so I get you wanting to spend time with the book, too 🙂 Enjoy and I can't wait to find out what you think of it!